The knowledgeable team members combine decades of practical know-how in water and wastewater testing, providing valuable insight to treatment issues. Ensuring the right processes, design parameters, and equipment size are essential to an optimally performing and cost-efficient wastewater treatment facility. This is particularly critical in industrial applications where variations in the quality of influent require more specialized treatments as compared to municipal processes. To meet these needs, WesTech provides 110 different products, encompassing a focus on filtration, sedimentation and flotation systems that are particularly utilized in industrial, commercial, and institutional facilities to treat high-strength wastewater. All of these products are supported by the company’s extensive in-house laboratory testing capability and staff expertise. The WesTech lab is quite unique in the breadth of services that it can perform, providing a wide gamut of testing options during system development, and for troubleshooting and process optimization with installed systems. 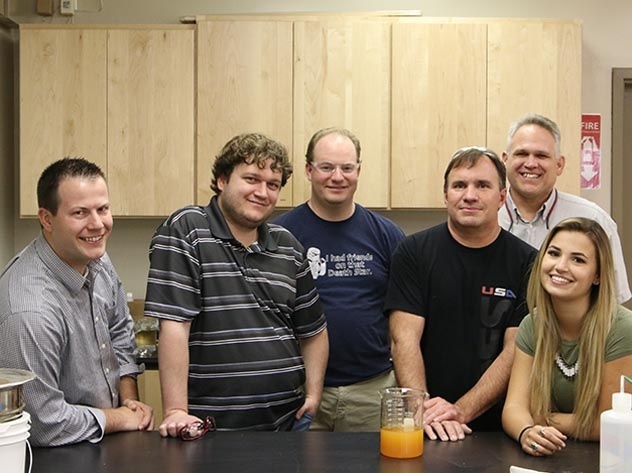 “The lab has been in existence for 45 years, starting with the beginning of the company,” said Mike Chambers, WesTech Application Engineer and laboratory head. In sizing a clarifier or thickener, the important factors are generally the solids settling rate, which corresponds to an effluent rise rate, and the area required to thicken the solids. The design values that represent these factors are the design rise rate which uses the flow rate of the effluent to determine the unit size, and the design unit area which uses the solids loading to determine unit size. The detention time required to obtain a particular effluent clarity is also important. 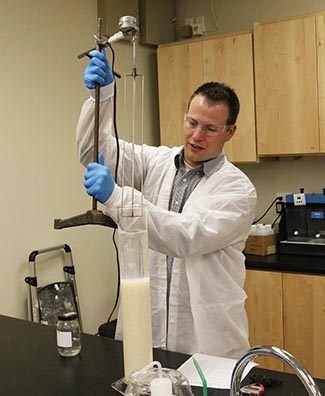 Sedimentation testing at the WesTech lab is typically conducted with a 2,000 mL graduated cylinder fitted with a slow turning rake mechanism to simulate rake action found in full-scale units. These recommendations benefit customers who are looking for guidance from WesTech on equipment suggestions. For example, WesTech employees from the Ames, Iowa, office were working with a hog farm in the Midwest to reduce iron and manganese from surface and well water that the hogs needed to drink. Chambers went to the farm and conducted jar testing on their water to see what would work best to oxidize the iron and manganese. Later, Richard Cutler, WesTech Applications Engineer and laboratory services group member, went to the farm and helped run a pilot plant which included air for oxidation, mix tanks and the plate settler. Test results showed that the pilot was effective, and the customer decided to purchase full-scale equipment. 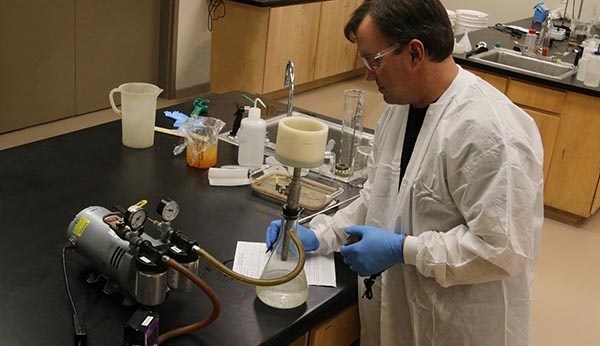 Other small-scale testing includes bench-scale vacuum filtration studies performed by the lab to determine the distribution of particle size in wastewater, and establish the optimum filtration system to separate the solid-liquid mixtures. 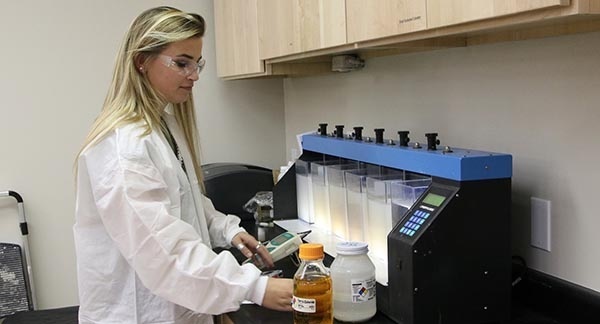 In addition to the industrial market, WesTech lab’s in-house capabilities address a wide range of municipal water and wastewater applications. These applications are typically concerned with reduction of Total Suspended Solids (TSS), color, pH, and turbidity. The lab can also target nutrient removal, such as nitrogen and phosphorus, or organic compound removal such Biochemical Oxygen Demand (BOD), Chemical Oxygen Demand (COD), and Total Organic Carbon (TOC). This type of testing is typically done using standard jar testing procedures using coagulants and flocculating polymers. Most of the time, the type of wastewater treatment systems to be used is already determined before testing. Occasionally, the lab will need to evaluate a couple of competing systems to determine which will work best, such as type of clarifier, for example – whether a Solids CONTACT CLARIFIER™ or a ballast clarifier, or high-density sludge system will work best. Once the lab completes its testing, a comprehensive report is prepared for the company, and the water treatment options are discussed with WesTech sales or production groups.